There were a number of double acts that shone during the heyday of Copla Española. Pepe Blanco and Carmen Morell were one. Here we take a look at their individual careers and their work together. José Blanco Ruiz, better known as Pepe Blanco, was born in Logroño (La Rioja) on 19th March 1911. He worked as a cart driver and later as a taxi driver and after the Spanish Civil War he started performing in the Café Ibiza in Logroño where his imitations of Pepe Marchena earned him the stage name “Marchenita“. In 1933 he had recorded his first album and in 1946 he set up his own company for the show “Alegría” together with Carmen Morell, with whom he performed for a number of years, until 1961 when he moved to Madrid with his wife and children. He recorded more than 150 songs, thirty with Carmen, and took part in half a dozen films. After he stopped performing with Carmen, he worked with artists of the stature of Juanito Valderrama, Rafael Farina or Antonio Molina. He died in Madrid in 1981. The year before a street was named after him in Logroño. He was buried in Logroño and his son, one of his grandchildren and one of his great grandchildren are also named after him. The singer of Copla Española and Folkloric music Rosa Ferrando Galindo, whose stage name was Carmen Morell, was born in Barcelona on 13 January 1925. Her father was from Albacete and her mother from Valencia and they had moved to Barcelona in search of work. She started singing as a teenager whilst working as a pastry cook. A great admirer of Concha Piquer, she soon became adept at singing a wide variety of styles including zarzuela, cuplé, jota and above all, folklore español and copla andaluza. Before joining Pepe Blanco, Carmen Morell had already shown what a fine singer she was. In 1946 she started performing with Pepe Blanco in the show Alegría, with music by the maestros Quintero, León and Quiroga. With pepe Blanco she recorded thirty songs with Pepe Blanco, took part in several travelling shows and starred in three films. They had a passionate affair, although she had to put up with his serial infidelity. She also had to put up with a smaller share of royalties and performing rights, which Pepe Blanco justified citing his own, superior popularity. The duo were one of the most popular on the circuit and split up in 1961. 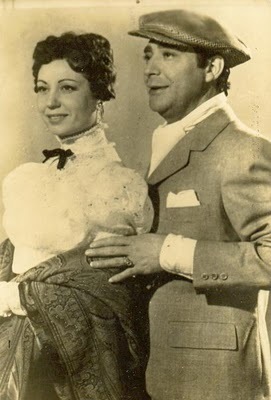 Carmen Morell and Pepe Blanco’s success on the stage was recreated on the silver screen with three films La mujer, el torero y toro (1950), Amor sobre ruedas (1954), and Maravilla (1957). After the split, Carmen continued her solo career, setting up her own company and taking part in festivals. After some time out of the limelight she made a comeback in 1990 taking part in a number of TV shows to promote a compilation of Copla Española put out by EMI. She is now retired and lives in Valencia.